After having already recently been named 2017 Tax Provider of the Year for the Americas region at a gala awards dinner in Denver in May, Bright!Tax has also now been named a finalist for a second prestigious FEM EMMA Tax Provider of the Year Award, this time for the Asia Pacific region. The Forum for Expatriate Management (FEM) unites the worldwide Global Mobility community through an online news and information portal and an annual calendar of international events. 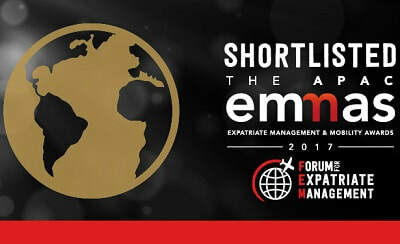 The FEM EMMAs (Expatriate Management and Mobility Awards) recognize excellence and innovation in the fields of Global Mobility and Services for Expats. The new nomination is a testimony to the way that Bright!Tax has been transforming the process of filing US taxes from abroad. In 2017 we have launched both our Online Client Tax Organizer, which alleviates the necessity for expats to complete a long questionnaire form when they begin their tax return each year and the Bright!Tax App, which allows our clients to file their US taxes from their phone or iPad, communicate with their Bright!Tax CPA, keep track of how many days they spend in the US, and securely scan and upload tax documents from their mobile device. Greg Dewald founded Bright!Tax five years ago when, after having moved overseas he discovered for himself how complicated, stressful and time consuming filing US taxes from abroad can be. Bright!Tax now strives to make the process as straightforward and stress-free as possible for our clients, and we now proudly provide tax services to American expats in over 150 countries.